may at every moment be a deterrent. so that you may close your lips from foul speech. so that you may fear to contemplate a wicked deed. The spiritual practice of murāqabah consists of opening one’s heart to receive divine truths, spiritual enlightenment, spiritual abundance, prosperity and bounteous spiritual gifts. It also consists of keeping one’s heart ready for spontaneous thoughts or inspirations of this kind, and purifying and clearing one’s inner space for these divine manifestations. Murāqabah may also be described as the practice of disconnecting from all else besides God, turning towards the Truth (God) in purity, perceiving the comprehensiveness of the Divine Knowledge surrounding everything, and continuing to worship while guarding and preserving this inner purity. Sufis understand murāqabah as the practice of observing and contemplating God within the heart, in order to attain the highest degree of perfection in contemplating the Divine essence. One is always aware that God is seeing one, hearing one, knowing whatever one is doing, and knowing one’s every state. This is because the Truth is a witness to the human being’s every state and every activity. In every instant, God is in the act of watching. To emphasize the point, Sufis have said “If you are going to rebel against your Sustainer, do it in places where He/She won’t see you” — acknowledging that nothing is outside Allah’s vast encompassing knowledge and embrace. There are many murāqabahs, and the first is called the murāqabah of the Oneness of God (Murāqabah-i Ahadiyet). It begins simply with the assumption that this murāqabah is possible. When the sheikh perceives that a dervish’s inner soul is becoming illumined during his practice of remembrance (zikr), the sheikh introduces instruction for the murāqabah of the Oneness of God. The inner essence of the murāqabah is the dervish’s (salik’s) turning his face towards the Truth with huzur (peace of mind, peace, ease, repose, quiet), without doing the silent zikr. He leaves behind even the inner connection to his lineage. He sits silently ready and waiting for Feyz-i İlâhî — Divine spiritual gifts of enlightenment — to arrive in his heart. And it may happen that he receives a gift of one of the faculties of Divine grace (Letâife Meleke), a spontaneous zikr of praise. His light (nûr) becomes the best and highest Light (nûr alâ nûr). As noted above, for the Murāqabah of the Oneness of God the salik should commence with the assumption that this murāqabah is actually within his range of possibility. For this murāqabah and for all other murāqabahs, the follower of the path shall suppose that his inner self is as deep and wide as the circle of the murāqabah, which he is entering. He may be assisted by the state of his guide, who is fully aware of all that is possible when one turns in heart and mind toward God. 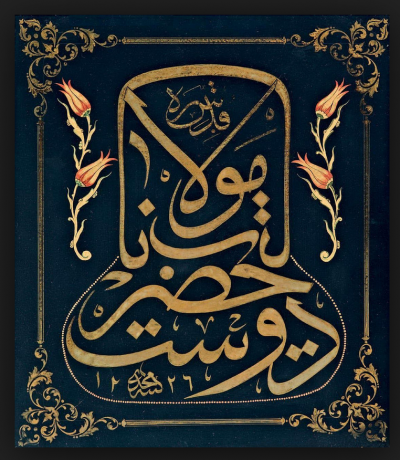 In the unity of all time, with supplication and rapture, the guide faces the Divine and becomes the murakib, the one who attains or achieves murāqabah. Thus he becomes the provider of never-ending spiritual gifts. He is the one who goes into ecstacy. He enters into a loving affectionate conversation with Allah, May His Name and Essence be exalted. As the dervish turns his heart and mind to God, it may be that a certain quality comes into his mind called the huzur-i kalbi (the peaceful heart, the heart at ease, heart at peace, calm abiding). This peace of mind (huzur) is actually the purpose of every zikr ever done. It is La illaha; it is il Allah. The blessed bountiful gift attained at the destination is the devotee’s own heart. As the divine spiritual abundance continues to flow into the heart, the heart is magnetized by the Divine attraction. The heart becomes so illuminated that it ascends in ecstacy, and advances toward God. This is called “seyr il Allah” (spiritual progress in Allah or travel in Allah). The tarîkatçı dede would greet each dervish, bowing respectfully (baş kesmek). Each dede would return the greeting. Then together they would all sit and would kiss the ground, as a gesture of humility. Next the taşra meydancısı, the person responsible for maintaining the outer surroundings of the tekke, would bring in a tray with morsels of bread. He would offer this bread first to the tarîkatçı dede, then to the dervishes on the right of the tarîkatçı dede, and then to those on the left. The morsels of bread were called “çörek” (pastry). Anyone who did not wish the bread was free to refuse it. Those who accepted the bread would next be served coffee. The dervishes sitting on the right of the tarîkatçı dede were again served first, then the ones on the left. After coffee, it would be time for murāqabah. In the murāqabah, whatever was in the heart would be thrown away. The student and the teacher would become essentially one in heart. In this way they would be present together on the road to Allah. During the murāqabah, the eyes were closed and the hands were positioned on the thighs. The teacher was visualized. Then the dervish would wait silently for the Divine bounty, the manifestation of God to man. After all had rested in murāqabah for a period of time, the practice would be brought to a close by the ser-tarîk . At other times the aşçıbaşı (the cook) would perform this duty instead. This leader would recite “Auzü billahi mineş shaytanir racjm Bismillah-ir Rahman-ir Rahim” (“I seek refuge with God from every recalcitrant Satan; in the Name of God, the Most Compassionate and Most Merciful”). Then he would read aloud Sûra Nasr. Then all together would recite the Fatiha and a version of the Rose Prayer (gülbank), and would all say Hu. Afterwards, all would kiss the ground. Then according to their rank, with the ser-tarik or the cook going first, the dervishes would again bow. Without turning their backs on the meeting space, they would exit walking backwards, greeting (bowing to) the space one last time before leaving the hall. The twentieth century Mevlevi scholar Golpinarli has described murāqabah in the tradition as the practice of entering into a heart relationship with the Qutub (pole), the spiritual figure who embodies the Truth of the Prophet Muhammed in the present era, the owner of the time. In murāqabah one can expect to receive spiritual gifts from the pole. Golpinarli also describes murāqabah as seeing and being seen by Allah. The follower of the path removes everything other than Allah from his heart and enters into union with his teacher, perishing in his teacher’s existence. In this way he perseveres to reach true Being. According to the tradition of the Prophet, immediately after salaat the imam should stand face to face before his congregation. Even though in modern times this practice is generally not regarded as a requirement, it should be considered a prescribed part of the salaat. In the early days of Islam the Prophet Muhammed, the Place of Refuge and the Protector (Zât-ı Risâlet-Penâh) (May peace and blessings be upon him), would sit face to face with his companions to show kindness and favor as they sat in murāqabah. He would typically take three short rest periods at intervals during the practice. According to the tradition of the Prophet, it was customary to observe silence from just after the morning Fajr prayer until daybreak, and again from the midafternoon Asr prayer until sunset. As these periods of silence ended, just after sunrise and sunset, the Prophet would turn in mind and heart toward God for a lengthy interval — preparing hearts for reflection (akis), illumination (işrâk) and the manifestation of holy lights of the sacred Divine within the mind (sünûh). Those experienced in murāqabah would receive their allotment of the divine spiritual gifts and experiences of opening (fütûh). In light of all this history, Islamic juristic authorities (mujtahids) have agreed that the murāqabah practice — turning to God — is grounded in the life and tradition of the Prophet Muhammed (Sünnet-i Seniyyeye). It was understood that in the murāqabah, dervishes’ essences were fortified and strengthened by the degree of the spiritual radiance of their time. In the practice of Mevlevi lodges, immediately after the Fajr prayer, the entire company of dervishes would solemnly recite God’s Majestic Name, Allah, in order to invite the Divine attraction into their hearts. 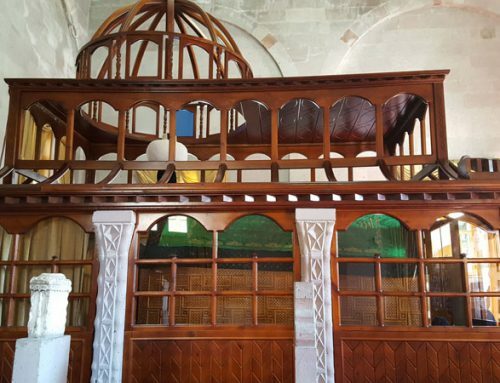 Afterwards, hücre-nişînler  (the resident dedes) would begin the murāqabah in the main chamber of the tekke (meydan odası), with the most senior member of the order occupying himself with turning towards God in heart and mind. Thus this formal murāqabah was reserved for these hücre-nişînler. To prevent human darkness from affecting those sitting in murāqabah, any dervish who was in disgrace was not be allowed to participate. Similarly, the newer dervishes (nev-niyaz) were viewed as novices in whom there might be a trace of darkness in the heart. Because of this possibility, nev-niyaz were required to sit in the main room of the kitchen, ordered according to their ranks. Novices did participate in the informal mandatory silence every morning from Fajr prayer until sunrise, and from Asr prayer until sunset. It was customary after the morning Fajr prayer for both the resident dedes (hujrenisinan) and the novice Mevlevi dervishes (nev-niyaz) to solemnly recite together Ism-i Celal (God’s Majestic name, “Allah”). Afterwards, the resident dedes would do the morning murāqabah together, followed by all the novice dervishes. After the afternoon Asr prayer, in their individual cells, each resident dede would be occupied with reciting those Names of Allah (ism-i zati), which he himself had been given permission to practice or the zikr of “la ilahe il Allah”. Immediately following whichever practices they had been authorized to do, the dedes would occupy themselves with either “a heart connection with the pir” (rabita) or murāqabah until the time of the sunset Maghrib prayer. Depending on their current level on the path, the novice dervishes would also occupy themselves with appropriate practice after the Fajr and Asr prayers. As a part of their morning and evening service, they would practice murāqabah as individually directed, for half the amount of time of the more experienced dedes. After bathing and performing the Friday Prayer, novice dervishes were permitted to go outside the tekke to fulfill lawful personal needs as needs arose. However they were forbidden to socialize or mingle with the public before returning to the lodge, so as not to interfere with the process of purification of their hearts. The novice dervishes were also prohibited from socially interacting with those who had completed the 1001-day training. This was to ward off the possibility of the senior dervishes’ hearts receiving any darkness which may have remained in the novice dervishes’ hearts, from even minor lapses in purifying their hearts. This practice became an element of the courtesy of the path (adab). Huseyin Azmi Dede also notes that some have considered the Mevlevi way of doing murāqabah by retiring to a secluded place as a kind of uncanonical heresy, since during Islam’s early times, turning towards God and doing murāqabah was not hidden. According to him, the reason that the Mevlevi murāqabah was done in a secluded place was so the darkness and vanity of everyday life would not reverberate while the practice was done. This type of seclusion was not needed for Hz. Prophet’s murāqabah, since it is not possible for the tyranny of darkness to reach our Prophet, who is entirely a source of Light. To settle the question about whether murāqabah practice during the Prophet’s time was not hidden: it is impossible for darkness to approach or come near to the peaceful one with the Light of Lam, the Place of refuge and the Protector, his Excellency our Prophet, Huzûr-i Lâmii’n-nûr Cenâb-ı Risâlet-Penâhî, (May peace and blessings be upon him). This is why it was completely unnecessary to hide or to be hidden; and this should be enough to settle this issue. .
For the Mevlevis, as in all traditions of Sufi education, the spiritual guide would keep the student under observation as they progressed in their spiritual education. The teacher would explain for each student mental and spiritual states that the student would have difficulty understanding or explaining for himself. Twice a week, it was deemed necessary for each of the novice dervishes progressing on the spiritual path to go in the evening to the cell of the head of the tarikat. Each would go alone, since their experiences and levels would vary. Each would have the honor of gaining spiritual abundance and benefits from the conversations. 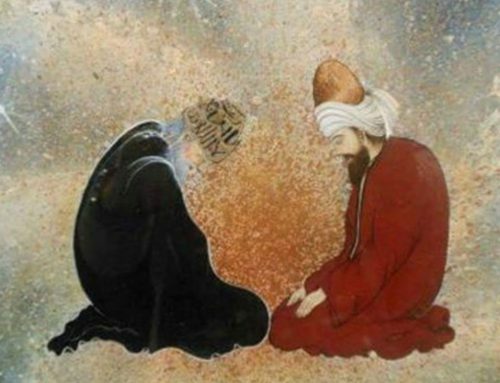 The teacher would explain spiritual experiences that the dervishes might encounter, such as dreams (rüya), visions (vâkıa), sudden inspirations (vâridât) and revelations (müshâhede), and would seek to resolve any of the dervish’s hardships or difficulties. Every morning, immediately after the Fajr prayer at the small mosque within the lodge, dervishes would recite out loud solemnly Ism-i Celal (God’s Glorious Majestic name, Allah). In the main hall reserved for the resident dedes of the lodge, these dedes would then do murāqabah for half an hour, turning in heart and in mind to the head of the tarikat. Because the novice dervishes varied in their levels and degrees of spiritual transformation of the nafs, and in their particular states of spiritual contemplation of the divine essence, these young dervishes would meet individually with the head of the tarikat at his cell twice a week in order to explain their condition, describe their hardships or difficulties, and benefit abundantly in spiritual matters through the honor of his conversation. Ankaravî, Minhâcü’l-Fukarâ, s. 306, 307. Ayrıca bkz. Kuşeyrî Risâlesi, s. 330-335. Halil Hamdi, İrşâdü’r-Râğıbîn İstanbul: Mahmut Bey Matbaası 1307/1890. Pakalın, “Murāqabah”, OTDTS, II, s. 620-621. Hüseyin Top, Mevlevî Usûl ve Âdâbı, s. 45; Gölpınarlı, Mevlânâ’dan Sonra Mevlevîlik, s. 409-410. This is a particular Mevlevi rank. The tarikatci dede was in charge of the training of dervishes in the tarikat (Sufi order), particularly in Mevlevi adab (the courtesy of the Mevlevi tradition). Baş kesmek literally means “cutting down one’s head” — the traditional dervish greeting denoting the meeting of the two inner souls. The ser-tarik was another Mevlevi rank, the most knowledgeable sheikh of the Mevlevi order of the time. The sheikh of the Konya Mevlevihane traditionally held this rank. Gölpınarlı, Mevlevî Âdâb ve Erkânı, s. 125. Gölpınarlı, Mevlânâ’dan Sonra Mevlevîlik, s. 409. Futūḥ (Arabic script فتوح, singular fatḥ فتح) is an Arabic word with the literal meaning of “openings”. “al-Fātiḥah” being the “The Opening” verse of the Quran. Those who strive hard to acquire the most correct and the most sound Islamic views, and struggle sincerely to interpret Islamic Law to the best of their abilities according to Islamic principles of jurisprudence (Fiqh). The word hücre-nişîn derives from – hücre, meaning cell or chamber in Turkish, and nişîn, from Persian, meaning a sitter in a cell. The term “kapıdan gecmek”—“passing through the gate” denotes being authorized to participate in the formal murāqabah. There were three levels of dervishes traditionally associated with the Mevlevi lodges. The first group consisted of novice dervishes engaged in the 1001-day training in the matbah (kitchen), who were called can or jan. The second group consisted of dervishes who had completed the 1001-day training and had participated in a ceremony called “kapıdan gecmek” (passing through the gate). These were given the Mevlevi rank of “dede” and became hüjre-nişînînân, resident dedes of the lodge. In the Mevlevi tradition, a dervish continued to be addressed as “dede” even after attaining the administrative position of head of the lodge, when a former leader had passed on (died). The final group consisted of the “muhib,” “the lovers of the Mevlevi path,” others who were connected to the lodge and had been given a Mevlevi sikke. As a part of giving a Mevlevi sikke to a muhib, the senior dede would pray for the initiate by dedicating his/her sikke with the phrase “Allah-u Akbar” (tekbir etmek). Hüseyin Azmî Dede, Nuhbetü’l-Âdâb, vr. 3a-4a. Hüseyin Azmî Dede, Nuhbetü’l-Âdâb, vr. 1b. Hüseyin Azmî Dede, Nuhbetü’l-Âdâb, vr. 1b-2a. Hüseyin Azmî Dede, Nuhbetü’l-Âdâb, vr. 2b-3a.